This is a battle between two very different Waterpik flossing devices. On one hand, there’s the Waterpik WP-450, a cordless, handheld oral irrigator ideal for traveling. On the other, there’s the Waterpik WP-100, a 1.48-lb. countertop water flosser with a 22-ounce reservoir. From that alone, you must have made up your mind as to which model you’re going to purchase. But we promised a full comparison, so let’s give it to you in this Waterpik WP-450 vs WP-100 report. Here, we list down these water flossers’ main differences. The most notable difference between these two Waterpiks is the type of flossers they’re classified as. 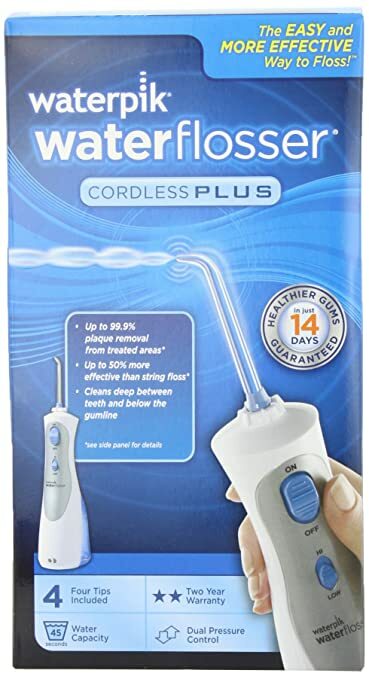 The Waterpik WP-450, also known as Cordless Plus, is a handheld oral irrigator that runs on a rechargeable NiMH battery. It weighs only 0.74 lbs, making it a good water flosser for travelers. Waterpik says that it’s also ideal for bathrooms with a limited space. The Waterpik WP-100, also known as Ultra, is classified as a countertop flosser. It’s meant to be stationary, and weighs 1.48 lbs. Both of these Waterpik water flossers have a tip that can rotate to a full 360-degree angle. However, they’re not equipped with advanced features such as chrome accents, a timer, a massage mode, and an LED function indicator. Overall, the Waterpik WP-100 has more power than the Waterpik WP-450. Based on the data we’ve gathered, it can give out a jet of water with a pressure that measures up to 100 PSI. On the other hand, the Waterpik WP-450 has a pressure range of 45 to 75 PSI. Let’s not forget to mention that the WP-100 comes with 10 pressure settings to choose from. The Waterpik WP-450 offers only 2 pressure options. Which one has a bigger water tank? It’s the Waterpik WP-100, whose reservoir has a 22-ounce capacity, giving you up to 90 seconds of flossing time. The Waterpik WP-450, on the other hand, has a small water tank, which can fill only up to 7 ounces of water. Flossing time is up to 45 seconds. Which of these water flossers should you buy? Let’s end this Waterpik WP-450 vs WP-100 comparison report with this recommendation. If you’re always on the go, a portable oral irrigator is the more practical choice. 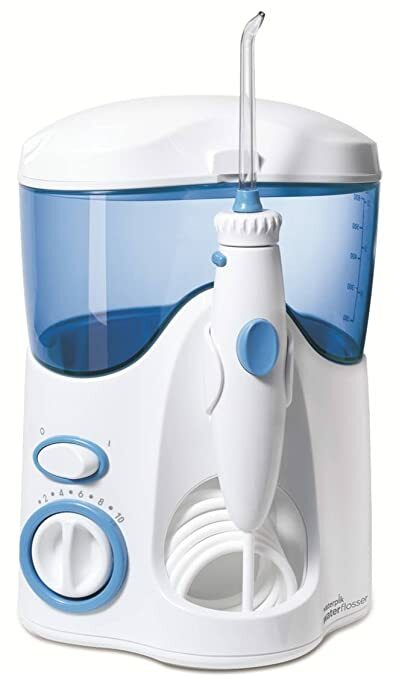 The Waterpik WP-450 is one of Waterpik’s long-standing products, and overall, it’s a reliable portable flossing device. However, if you’re not into battery-operated devices, know that there’s the Waterpik Sidekick, a collapsible countertop-type water flosser targeting travelers like you. If you want a reliable countertop Waterpik with basic features, then choose the Waterpik WP-100. Note, however, that there are better models out there. Examples include the Waterpik Aquarius and the Waterpik WF-05, a whitening water flosser.